Linking to own blog is something that every blogger does. Normally, after I finish writing a blog, I shall receive email notifying that I'm receiving ping(s) from the blog post I have just written. Then, I had to delete the mail (it's polluting my pure inbox), then delete the ping manually. 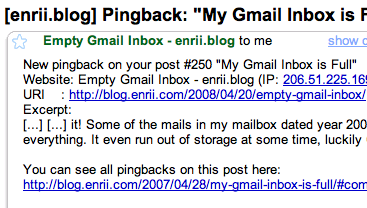 I can accept ping from other blogs, I just don't like to see my own ping showing up in my own blog. Just days ago, when I was browsing in WordPress support forum, I saw somebody asked how to disable self pings. I never thought somebody actually created a WordPress plugin to do this. Do you want to send an error report to Microsoft? Exactly what I need of my sites, thanks for sharin!